Rarely does an entrepreneur travel to a foreign country for a short-term project, and then in the first few months befriend locals and start a company with them. The story sounds amazing, right? Yet it happened in Bangalore. This, however, is just one path of the larger road less traveled by Mr. Bruce T. Dugan. When the story began to spread – An American showed up and started a company with a couple of locals — “Young people stated showing up at the cafe that we worked out of, wanting to join” Mr. Dugan recalls. Mr. Dugan had founded INICIA INCORPORATED in 2005, and co-founded its media – technology subsidiary in Buenos Aires in 2005 with co-founder and CTO Mario Delfino.in In 2018 they’ve begun to work more integrated on several large scale projects. Incognito Worldwide, which was incorporated in India in 2014, though initially a tech-oriented company, shifted its prime focus in 2015 and since evolved into a full-service boutique digital agency. They offer branding & design, consulting, digital marketing, website development and technology integration. The company’s client base is mostly from the United States so it had to deal with time zone, language and culture barriers. It has, and now also serves as the back room fulfillment center for several agents in the U.S. The company has also expanded into online property partnerships, like iUrban.me and other magazines, and eCommerce stores like Ayurveda. online. Mr. Dugan launched another subsidiary of Inicia Incorporated in 2012, Intech Creative LLC., which had developed several digital products during 2015-16. Those products are now undergoing modifications via i2MEDIALAB (Buenos Aires). Incognito Worldwide avoids tech jargon as often as possible, to have clear and concise discussions with their clients, so that they can convert the client’s’ vision into practical reality. From making a logo that is simple, recognizable and memorable, to developing a website and making it visible in search, or developing custom coded platforms, the company provides services from end to end. It’s client base crosses a wide spectrum of industry sectors, including personal blogs, restaurants, brands for eCommerce, TV personalities, lawyers, local services, transportation, and financial service firms. Mr. Bruce T. Dugan seems to have an eclectic skill set. Not only has he run companies in the areas of logistics, entertainment and technology, he is/been also (under a pseudonym) an author, reporter, columnist, and magazine writer for American Songwriter magazine, Jazz Review, Glide, The Examiner, Entrepreneur, and CEO Hangout. As he travels he writes reviews for TripAdvisor (as a hobby), but with over 80,000 followers now finds himself ranked in the top 1%. He is member of the National Writers Union, Society of Professional Journalists, and International Federation of Journalists. Mr. Bruce T. Dugan, spoke with our assistant editor, Mr. Vikas Jha, to share some adventurous and learning experiences that he has had till now. Here are the excerpts. 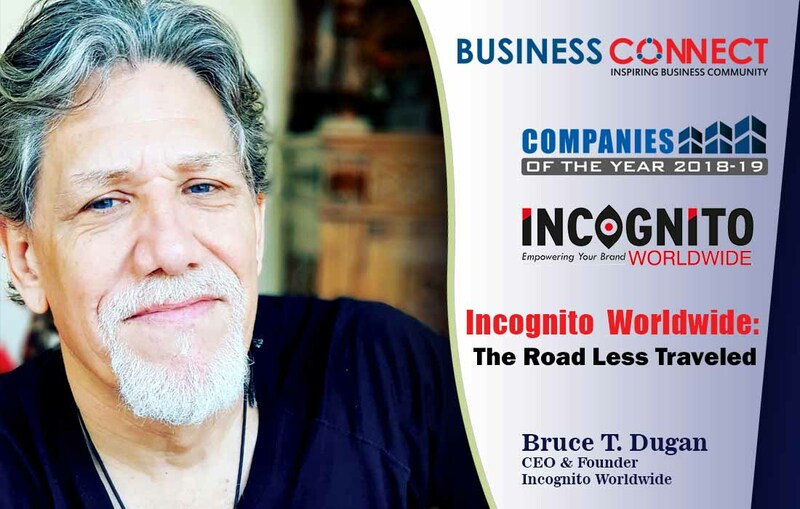 Hi Mr. Dugan, thank you so much for your time; we are honored to have you featured in Business Connect. Can you tell us something that we do not know about you? I’m older than I look, and have many more business scars than I’m willing to admit (smiles). I love creating things, be it a new product, a marketing campaign, or writing an article, or book. Traveling and exploring new places and cultures is a passion for me; November on the beach in south Goa has become a favorite spot. I was born and raised in New York City, and still spend time there, as well as Buenos Aires, Argentina, and Bangalore, India, and had also lived offshore in Cannes, France, and San Pedro, Mexico. I’ve traveled most of southern India by motorcycle, and this past September (2017) — along with Nihanth (who is a Director at Incognito) — traveled by motorcycles to Khardung La in the Himalayas. It was amazing. Then on the 31st day, it wasn’t — when a car swerved into my lane on the highway (in Kashmir) and hit me head on. My femur bone broke in 2 places and came right through the skin; I broke the ankle in 3 places, as well as the wrist in 3 and had to have reconstructive surgery. We were filming the trip for the documentary Ride Of Your Life (for First Drum Films), so some of the accident footage will likely be edited into the final cut of the film scheduled to be releases in 2019. As amazing as the traveling through the passes of the Himalayas were, the real adventure was the time I spent post accident in a military hospital in Kargil, a week in a government hospital in Srinagar, and then a 50-hour overland trip back to Bangalore (by car and train, because the airline would not let me board the airplane). It’s been over six months since my last surgery, and I’m still on crutches, And yes, once I’m walking again I will also be riding again! Internet marketing in the 1ate 1990’s didn’t really exist, it was mostly just directory listings and banner ads. Nobody really knew yet was the Internet was or how it could be used. Of course, before marketing became a dominant force on the Internet we still had several years to go before technology innovations came along to expand the Internet from being just an online brochure of information, into a true interactive space. A Few words about Google’s RankBrain! Because we have a steady inflow of client work for the short term, and partnership properties we’re managing and promoting over the long-term, my plans this year have been more focused on working with our directors. They are learning business management, business strategy, corporate compliance, and accounting among other things. These are foundational blocks that any self-sustaining entrepreneur needs to know. This allows them to then carry more responsibilities in the day to day running of the corporation, rather than just running the departments of their expertise.